Years a go a dear friend of mine wished to have a special piece made for her daughter as a Christmas Gift. Although we reside in Virginia, for a time we both lived in California and while we were there fell in love with the California Oak. Like the Dogwood tree in Virginia, the California Oak is protected by the state: rare, many ancient trees with massive trunks, powerful branches that are able to span great stretch of ground. In some groves they are deemed hundreds of years old with branches that are well over ten feet thick. My friend commissioned a sculpture that was to serve a purpose: an earring tree! Her daughter’s earring collection is apparently quite massive and her mother wanted to help her keep track. She wanted the tree top be large enough to hold as many earrings as possible and so she asked for the sculpture to be 12 inches across. The result is the Noble Oak of California sculpted in bronze and set on a stone. I included in the design a portion in the center where a candle may be nested within the top and many branches around the edge able to hold dangling earrings. All mounted on a large stone and wood base, this solid bronze statue came to 23 pounds of Carnival Bronze with a light patina. Now currently residing in a private collection. Merlin this is quite a piece! 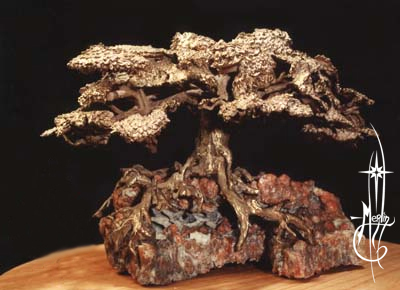 It reminds me of a bonzai in bronze and I love the detail you have worked into the root system. Great work!